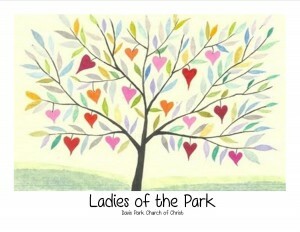 Ladies Ministry is a very broad term used to define a multi-facet ministry. Our heart is to reach women inside and outside the church with the love of Christ, see them grow in their walk with the Lord, and apply God’s Word to their lives. We want to encourage, equip, and strengthen them in their faith. Ladies Ministry includes teaching bible classes, celebrating brides or new mothers, and special events, such as retreats, teas, craft days, etc. We are involved in our youth ministry, hospitality ministry and encouragement ministry. Ladies who are friendly and have a heart for hospitably serve as greeters around the church or in the connection center. We believe that whatever gift the Lord has given each woman can be used in this ministry, from painting and singing to teaching and baking.